Here in Kentucky we may have missed the blizzard in the northeast, but it has definitely been very cold! I’ve been spoiled by the warmer weather the last few months, and it isn’t fun being reminded that it’s still winter. To ignore those wintery blues, here’s a fun floral quilt to help us dream of spring! Susan brought me this sweet Rail Fence quilt. Isn’t it fun the way she turned her blocks to create a pinwheel look? I love all the fun flowers, especially the daisies! They’re so sweet and feminine, this quilt would be perfect for a little girl. The only challenge of those fun prints is it’s super easy for the quilting to get lost in all the fabrics. Susan and I agreed that a simple meander in a neutral thread would be ideal. 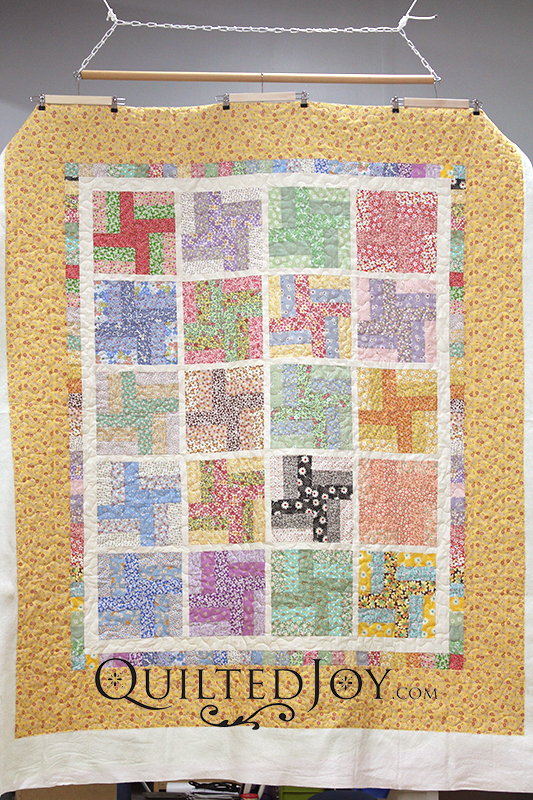 The meander quilting lets your eye travel over Susan beautiful piecing work instead of the quilting line. Previous post: Thank you, Judi! Next post: Lots of Renter Activity!